Quick Skips SA offers two types of mini skips bins; 2m3 and a 4m3 size bins. 1. Only fill the bin to the top of the rim (top rail) and there must not be any materials protruding over the top of the skip. Overloaded bins are dangerous and create health and safety issues and concerns for Quick Skips SA employees and the general public. If at any time an employee of Quick Skips SA deems any bin unsafe to transport, they will alter the load of the bin to make it safe to transport or arrange for an additional bin to be delivered (at the customers cost) and the customer will be asked to unload the excess waste that is protruding. , which may involve the having to wipe off the top of the load. 2. Once bins have been delivered, do not move the bin from where it has been originally placed. 3. If you have ordered a bin for a clean load i.e. soil, green waste, concrete or bricks and that the bin has been found to be contaminated with undeclared items upon dumping, customers will be charged for any overweight charges and any costs incurred by Quick Skips SA. 4. No liquids, food or hazardous wastes are to be put into the bin at any time. Hazardous wastes include asbestos, poisons, paints, oils, gas bottles and toxic wastes. 5. Tyres ($25), mattresses ($25) will attract a surcharge. Should any undeclared items be found upon dumping, customers will be charged for additional costs. Please confirm these additions with Quick Skips SA prior to pick up of bin. General Waste: Household rubbish but no soil, bricks or concrete. Green Waste: Grass cuttings, brush clipping, prunings and garden waste. Mixed Waste: Household waste, soil, bricks and concrete. Is Quick Skips SA environmentally friendly? Several reasons exist as to why we should promote recycling. Recycling helps us to convert our old products into new useful products, and it's good for the environment. Since we are saving resources and are sending less waste to the landfills, it helps in reducing air and water pollution. Quick Skips are strongly dedicated to helping the environment and recycling what we can! Can I hire a skip bin to be delivered on a weekend? Quick Skips SA operate over a six (6) day period and can deliver skip bins to you on Saturday between 7.00pm till 12.00noon. Please book your weekend deliveries in advance. How do I contact Quick Skips SA and hire a skip bin? 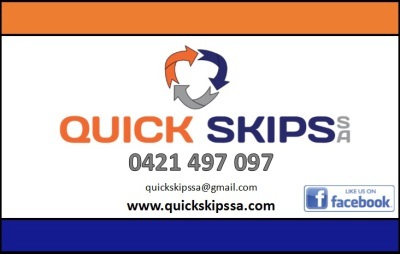 You can email us directly quickskipssa@gmail.com or from our Contact Us page on the website, find us on Facebook at Quick Skips SA or you can call us directly on 0421 497 097 between Monday and Saturday. Quick Skips SA accepts payment with all major credit cards and we also accept cash on delivery. Please ensure someone will be home to pay for the delivery on the day. No payment, no bin. Quick Skips SA guarantees a 24 hour delivery turnaround - order today and the skip can be delivered tomorrow or book in advance. We provide a 5 day skip hire as we understand everyone is busy and we would like to ensure you have plenty of time to utilise your skip bin fully. Quick Skips SA operate 7.00am - 5.00pm Monday to Friday, and 7.00am to 12noon on Saturdays. 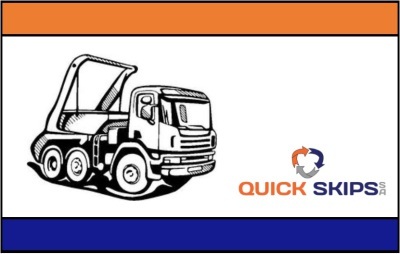 We also offer discounted prices on Quick Skips SA "quicky" 24 hour or 2 day skip hire. Ask us about this offer today! Where will the skip bin be placed? We must only place the bin on your property and not public land or land that does not belong to you. To minimise any damage of the skip bin being placed on your driveway, please place some wooden pallets down first. All damage above and below ground is at your own expense. We cannot place skip bins under a carport, but we can often place it at the front of your carport or over to one side to leave room for your car. Please confirm when you book your hire.